Soldiers march in downtown Riverside to honor veterans April 19. 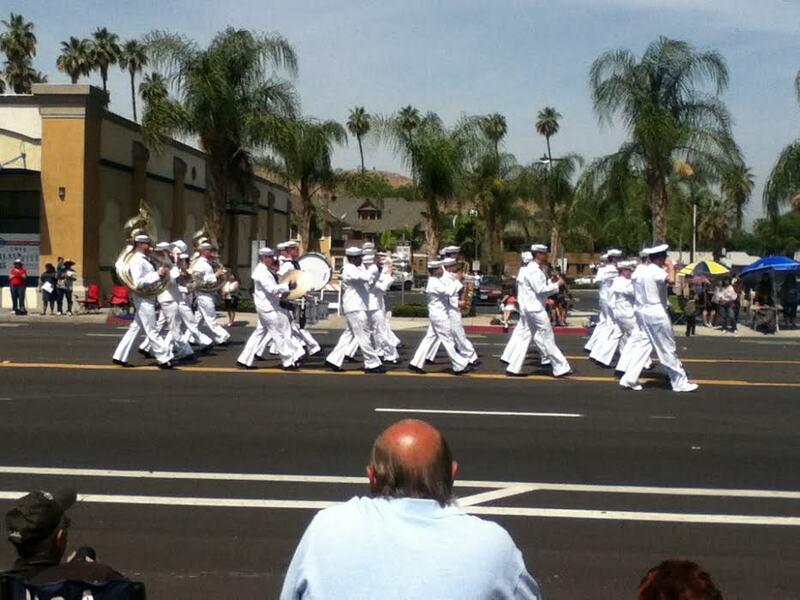 The ninth annual Salute to Veterans Parade was held April 19, in downtown Riverside. The parade honored men and women who have served in the military in times of conflict and tranquility and included representatives from every one of the services. Densmore is a member of the Salute to Veterans Parade Committee, which helped to put on the event. Her father, uncle and husband are all military veterans. This year’s parade expected more than 2,000 participants, featuring flyovers, equestrians, vintage cars, military equipment, high school bands and more. Families of different generations, children of all ages and veterans of many backgrounds filled the 1.2-mile route by the thousands, which started at Magnolia Avenue and Ramona Drive. It then proceeded north on Market Street, south on Main Street, and ended in front of the Historic Riverside County Courthouse. Huey UH-1, also known as “Slick” and Sikorsky helicopter, made their grand entrance as they danced the dance of flight throughout the entire parade. Children waved their American Flags as members from the Riverside Chapters of the Sons and Daughters of the American Revolution passed, and were surprised with the sounds of 1775 musket power. Grand Marshal Henry Coil Jr., one of the organizers for the parade, graduated from Poly High School in 1950, and from the University of Berkeley with a Bachelor of Science degree in Civil Engineering. Later he joined the Navy, attending boot camp in San Diego before serving with the Seabees in the Philippines. Coil’s life-long services to his country and community have been demonstrated through his military service, and through his membership in and commitment to the Boy Scouts of America. Coil was unfortunately unable to attend the parade because of illness. As the parade wound down, Riverside’s own trolley made its heartfelt appearance with the Society of Military Widows, made up of widows of military men of all ranks, grades and branches of service in the U.S. armed forces.